Prior to the nonfarm payrolls release, the dollar looked strong and many wondered whether the beleaguered currency had finally bottomed out. All eyes were on the average hourly earnings part of the report and as it turned out, the 0.3% reading was indeed bang in line with the expectations, which lifted the year-on-year wage growth rate to a good 2.7%. But that’s where the good news ended. The headline non-farm payrolls figure disappointed badly at +103,000 compared to about +190,000 expected. The weather was blamed for the soft jobs growth. What’s more, the January payrolls figure was revised down from +239,000 to +176,000, while February was revised up from +313,000 to +326,000. This left a net revision of -50,000 jobs over the two months. In a way it was the complete opposite of what had happened last month. Then, the headline jobs figure smashed expectations, but the average weekly earnings number turned out to be a lot softer than expected. This time, the earnings figure was strong, albeit in line with the expectations, while the disappointment was provided by the actual jobs numbers. Following the publication of the March employment report, market participants were left with more questions than answers about the pace of the Fed’s policy tightening in the future. So they sold the dollar and this helped to support buck-denominated gold, as well as the GBP/USD and EUR/USD currency pairs. The USD/JPY fell back to 107.00 short-term support level. Overall, though, Friday’s NFP report was by no means a game changer. The Fed is still likely to raise interest rates at least two more times this year. But this is fully baked in, and void of any fresh stimulus, the dollar is struggling to make a more meaningful comeback. Aside from the publication of CPI and ongoing trade tensions, the only other fundamental event that one needs to keep an eye on is the release of the FOMC’s meeting minutes, also on Wednesday. The rest of next week’s economic data are not too important. Thus, unless the CPI beats expectations, the dollar may struggle to find support. And with ongoing trade tensions weighing on risk sentiment, next week could see safe haven and buck denominated assets like gold and to a lesser degree, silver, shine. Gold was actually in the process of forming a bullish engulfing candle on its daily chart. If it manages to close above Thursday’s range and resistance at $1335 then this should give the green light for bullish speculators to step back in on gold after the recent pullback. Overall however, gold remains inside a wide range and there’s no clear long-term directional bias. That could eventually change if the metal were to break back above its trend line and the next resistance in the $1350s area, or if it breaks below $1300 support. 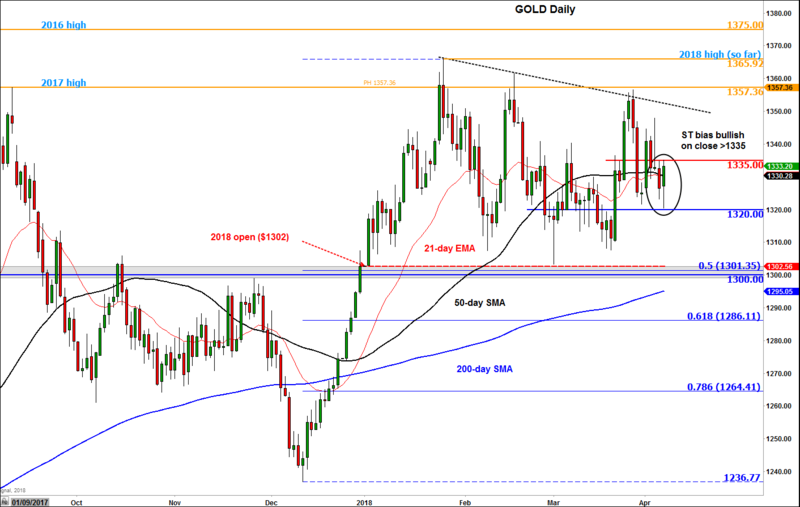 Given Friday’s bullish-looking price action, we wouldn’t want to see gold go below $1320 now. If it does, it will most likely then continue towards, and possibly below, $1300 next.